1.linear knife, manually cutting against up circular knife,for reduce stress. 2.eparate pre-scored PCB assembly without stress on either PCB or component . 3.Separating speed is adjusted by a rotary knob "
5.Board with projected component can be cut precisely "
6.Large stainless steel platform on both side of cutting blade prevents board wobble and table height and angle." 7.Clearance between circular and linear blades are adjustable to fit different groove depth and compensates for blade wear out ." 1.Use upper circular blade and bottom linear blade. 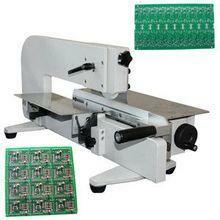 2.Cut pre-scored v groove PCB without stress on either PCB or component. 3.Clearance between circular and linear blades are adjustable to fit different groove depth and compensates for blade wear out. 4.Blades can be re-grinded to use.